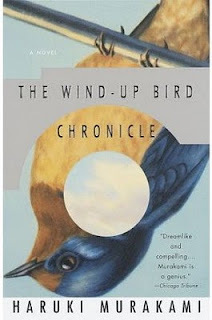 This month, the Japanese Literature Read-Along group, led by Tanabata, read Book Two of Haruki Murakami's The Wind-Up Bird Chronicle. You can read my thoughts on Book One here. I have a notoriously bad memory for books so I was surprised to find this one very easy to pick back up this month. Book Two definitely feels like the middle of a book. We rejoin Toru Okada, the unemployed main character of the story, as he encounters various mysterious characters and family members. I don't believe there were any new characters introduced in this section of the book. There was very little resolved and even more plot lines opened up. I still felt that everything seemed purposeful but the book started to veer more into the realm of the supernatural and it was a bit strange. I can't wait to finish this novel next month. I have no idea where it is going but I'm hoping for the best for Okada. He's a unique character. I will be discussing this more today at In Spring It Is The Dawn. Support our site and buy The Wind-Up Bird Chronicle on Amazon or find it at your local library. We received our copy from a fellow blogger. I'm glad you're still reading along, and enjoying it. I can't wait to finish it next month too! I've never read this author before, but I think this (or the one about the Japanese subway terrorist bombing) would be at the top of my list! I have never read Japanese books before, but generally, I really like Japanese visual art, and so I feel like I would like the written art as well.